Cosmetic dentistry is one of the most rewarding aspects of our practice. The ability to transform someone’s smile is truly one of my favorite things to do for my patients. The look on a patient’s face when they see the things about their smile that had made them self-conscious for years turned into a beautiful smile they can confidently show off is one of the best parts of being a dentist. That said, it can also be quite stressful! There is an enormous responsibility we take on when we commit to a cosmetic case. The subtle nuances of the anatomy of the front teeth become extremely obvious when they are not restored correctly. There are many ways to change a patients smile. If the desires of the patient aren’t completely understood by the dentist, it can create confusion or dissatisfaction with the end result. For these reasons, we use a step-wise method with our cosmetic cases to ensure we arrive at the desired result both from our dentist eyes, but also from the eyes of our patient. 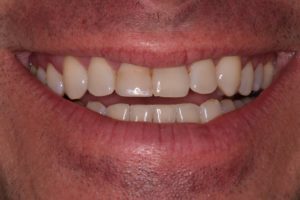 Cosmetic Dentistry… Where Do We Begin? The first step of any cosmetic dentistry case in our office is a consultation with the dentist. We choose to structure our day so that we have plenty of time to sit with patients during this consultation and answer all of your questions, as well as to determine what is really important to you about your smile. 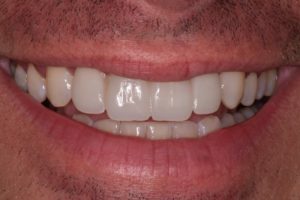 During this consultation, you will sit with a mirror and show us what you would like changed about your smile, and we can have a realistic discussion of both of our expectations. Once we are comfortable that we are on the right track, we make models of your teeth, and we take several photographs of your smile. We use these to plan your cosmetic case – think of this as defining the starting point on our road-map. From there, we can change the shape of the teeth on the models and in the photographs to determine our endpoint – what your smile will look like when we are finished? Finally, we come up with our step-wise plan for the case. This may include components where we use our road-map to communicate with our specialists the specific goals for the case. This information is invaluable when collaborating – there isn’t any guesswork along the way. Another advantage of using our cosmetic road-map is that we have the ability to test drive the case before we even start. The patient gets to see a preview of what their smile might look like once the planned treatment is finished, sometimes right in their own mouths. That information is used to make any temporary restorations, to allow for an even long test-drive of our map, and to make sure our patients are pleased with our planned outcome before the case is finalized. All of these steps take time, but in the end we find it makes our cosmetic cases more predictable and more enjoyable for us, and for the patient. Check out this case of a patient who didn’t like his four front teeth. We used this exact same process to let him preview the changes we could make to his smile. The second picture is our mock up of the case placed right on top of the patients existing smile. Without making any permanent changes to his teeth, he could see what the finished product would look like! No matter how big or small the changes you would like to make, we can help you create a customized plan to get you to a confident smile. Don’t hesitate to ask about our cosmetic dentistry options if there is something you don’t like about your smile. We will make sure your desires are met every step of the way!